My 8-year old daughter got interested in birds from a VERY early stage. By age 2 she could identify over 10 species of birds in our Johannesburg, South Africa, yard by call alone. And perhaps 20 others by sight. Her natural talent was astounding and surprising. Astounding because she picked up birding before she could speak and surprising because this ability was definitely not inherited from anyone in my family, myself included. So I guess for some people birding skills come naturally but, for others, birding skills need to be learnt. I’m often asked what are the best ways to get kids unplugged from technology and plugged into nature. I have three young kids and all of them love birds. Over the years, I have found that all kids learn differently but there are a few guidelines that can assist in encouraging kids to participate in our – often selfish! – pastime. Here’s a quick guide that encompasses some successes and lessons learnt. I’ve also included a few resources for those of you that might be inclined to invest in birding resources for your kids. 1. COLORING. Very few kids just take to birding like ducks to water (terrible pun I know!). So you have to break them in gently. From an early age children can get hooked on birds through some creative thinking and a little gentle persuasion. This does not come in any better form than coloring pictures. There are plenty of free coloring pages that feature birds and can be printed out direct from the internet. The best way to do this is give your kid the outline accompanied by a true picture of the bird. This will help your child figure out what colors go where on the bird and you’ll be surprised how much they love this! 2. READING. We all know that our little ones love a great bedtime story. Reading to your kids before they go to bed is an easy and simple way to subtly put birding right into their sub-conscious. I find that my kids take in a lot at bedtime. There are some really excellent kids birding books. A really great one for young children (ages 2-6) is called Bring on the Birds by Susan Stockdale. I love this book because its wonderful to read to my 3-year old but also awesome for my 5-year old to practice his vocabulary and words. The illustrations are really what makes the book, along with a useful identification guide at the end. When your child is ready to get his/her own birding guide I would recommend a Beginner’s Birding Guide like The Young Birders Guide by Bill Thompson. If you live in the States this is an informative and useful book that really takes birding to the next level for your kids. Publications like Ranger Rick and National Geographic Kids can also satisfy their curiosity through their kid-friendly articles on birds and wildlife. 3. GAMES AND APPS. What kid does not love games? Thankfully there are several really excellent family board games that you can play as a whole family. A few to try out are as follows: The Great North American Birdwatching Trivia Board Game and Bird-opoly. Also Audubon Guides has some of the very best apps for family birding excursions (check out their Ultimate Nature Series, an excellent resource for regional birding in the United States). They also have some great apps specially designed for kids like the Owl app. 4. BIRD FEEDERS. Birding with your children starts right in your backyard. A few feeders and a water-source are all you need. Your nippers will have great fun competing with each other – or you! – to see how many birds they can identify at home. 5. WALKS. Share your passion for birds continuously with your children whether it be spotting a bird whilst driving to the grocery store, identifying different birds at the beach or even keeping a list of different birds seen on TV. But without doubt the best way to connect kids with birds is getting them outdoors. Walks around the neighborhood or at a nearby wildlife sanctuary are good opportunities for kids to learn in fresh air. Kids loving getting out there and exploring. Try not to keep your walks too structured but present a challenge to your kids like “How many birds can we see on this walk. Can we beat our record?” I’ve never heard of kids that do not like a challenge but remember to keep it fun and exciting. 6. MOVIES. Movies featuring birds are always fun for kids and can consolidate their interest in birds. There are quite a few to choose from but some of the better ones include “Happy Feet“, a film about Emperor Penguins, and “Hoot”, a great story about saving Burrowing Owls in Florida. So when you can’t get outside due to inclement weather sit them down with a nice birding movie. 7. EVENTS, FESTIVALS AND CLUBS. Most places have some kind of birding or nature festival on an annual basis. These are excellent opportunities to get kids involved. Many of these festivals have live bird displays. I recently took my children – all 3 of them – up to the Space Coast Birding and Wildlife Festival in Florida. They thoroughly enjoyed the experience, especially the live raptor display by well-known Master Falconer, Jonathan Wood. As your children grow into birding it might be a wise idea to introduce them to a local birding club where they can meet other kids in their area who enjoy birding too. A good place to start might be your local Audubon chapter who will be able to point you in the right direction. 8. FOLLOW YOUR KIDS. And not the other way round. Kids often like to learn in their own ways. Whilst you might be focused on trying to teach your child the finer aspects of bird identification, your child might simply enjoy watching bird behaviors or drawing birds. All of this is good. Find out how your kids like to learn and tap into their favorite learning behaviors. 9. RESPECT NATURE. Children look to learn from adults so its important that you set a good example for your kids when out in nature. Picking up trash, sticking to paths and respecting wildlife are all important lessons for your kids to learn. These lessons set the foundation for a life-long appreciation of nature. I hope that this is a somewhat useful guide for you to share the wonders of your exciting hobby with the younger generation. Another resource is this post on 10,000 Birds. Lastly, a wonderful resource for adults is the book Last Child in the Woods by Richard Louv. This book explains how we are all at risk of raising kids with nature deficit disorder. But with a little planning we can ensure that our children grow up invested in nature. Enjoy and good luck unplugging your kids! Great post, James! Absolutely great. Thanks Jochen. There’s nothing better than seeing kids enjoying nature. Nice Nate! Its amazing how young they can start isn’t it? Thanks James, this is something that all parents should be encouraging. I’m lucky that both of my children enjoy coming with us and birding. They both have their own binoculars and Travis, my eight year old, is a far better bird then I am. Quicker eyes, and better ears. Thanks for this helpful post. My 11-year-old son caught the birding bug this winter, when we were participating in FeederWatch activities and I took him along on the Christmas Bird Count. A very enjoyable birding book for kids that I got him for Christmas, “Wild About Minnesota Birds,” by Adele Porter, really launched him. (There are others in the series for Wisconsin, Michigan and New England that I am aware of.) Now that spring is arriving here, he wants to go out just about every day to check for migrating ducks on local ponds. It’s been so exciting! Having the bird feeders right outside our living room window helped him really notice the birds and get hooked. @Clare. You are welcome. My kids spot stuff before me too! @Penelope. Those books sound pretty cool. Thanks for sharing. I’m pretty certain the reason for not getting expensive optics for kids is the same reason I shouldn’t be allowed to have them. Looking at my track record this summer, bins would be safer in the hands of most two-year-olds. An absolutely outstanding post with 10 great down-to-earth tips to get parents interested in birding as a family. 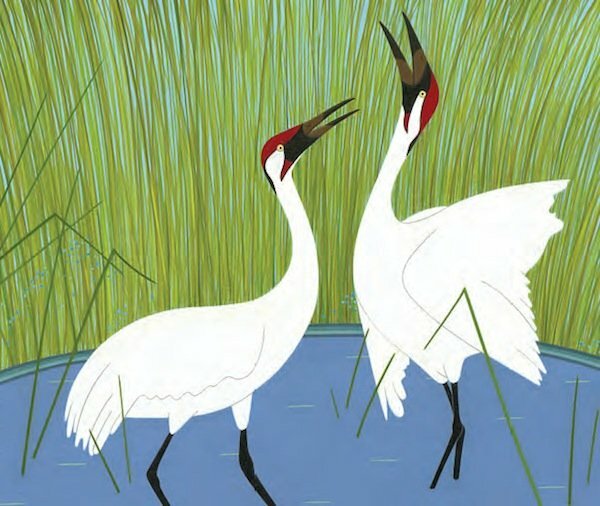 Each year – thourgh the Space Coast Festival – we offer educational opportunities to encourage families that bird & wildlife watching is the most inexpensive way to establish an enjoyable continuing outside activity with their children. 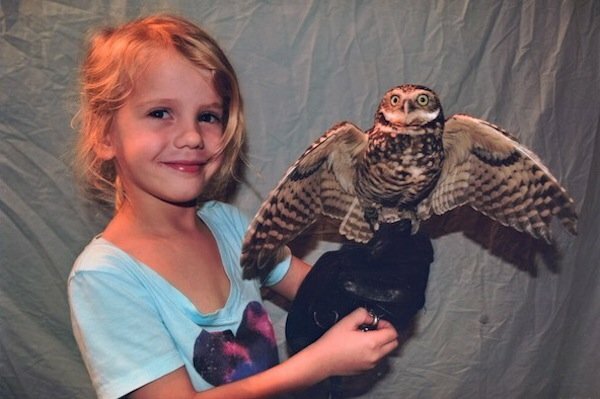 I am happy to report that The Raptor Project along with Jonathan, Susan and Rachel Wood will be at the 2012 Festival. @Neta Excellent news! Jonathan is a great guy and SO good with kids. My oldest is more interested in birding, then she lets on. So it was quite a surprise when she asked to do the Montezuma Muckrace last fall and was more than happy to help spot Crested Caracara’s and Burrowing Owls in Florida just a few weeks ago. She has also helped me on some owl survey’s, once assisted in a Snowy Owl rescue (in the Hudson River of all places) and most recently she alerted me to an American Woodcock that briefly visited our backyard. The issue is gettin her willingly to go out… which doesn’t always happen. When a interesting bird appears, she goes all out, but as many of us are aware there can be significant amount of down time between birds and kids, being kids, get bored, which is the #1 challenge we fight each time out. Of course she has also taken to spening Saturday mornings… eating Cereal and… well (to shamlessly promote your show) watching Birding Adventures. @Will Here I am trying to get people away from their TVs through TV. The irony of it all!! Thanks Will. Fantastic post James! I am been pointing out birds to my 2 and a half year old daughter in the field and in books but she doesnt seem to be all that into it yet. Hopefully that will change after trying out your tips although I realize that the choice to be a birder or not will be hers alone. @Pat I have 3 so if I can get 1 birder out of the 3 I’ll be stoked. But you’re 100% right, the choice has to be theirs. There’s a big difference between gentle persuasion and pushing. Pushing birding onto kids will seldom work in my opinion. Number 8 – Follow Your Kids – is so important and I’m so happy you included it. Also Number 9. My experience with my daughter and nephews is that some kids are, like your daughter, born with nature skills and an interest in nature. It’s just THERE, and all you have to do is follow. Some kids, like my younger nephew, can be taught. And, then there are the kids like my darling daughter that will just never engage with nature except for the occasional walk along a river. That is where Number 9 comes into play. We can’t put a gun to their head and say, BIRD or die. We can offer an example of nature-based ethics and respect for nature and the earth. @Donna Great advice and thanks for sharing! My 18 month granddaughter can field identify a half dozen yard birds by call (easier than by eye). Techie Dad bought an extra iPad with a lot of kid stuff. I’m looking for an ap guide that allows for creating easy to access favorite lists, with songs. Bonus would be ability to make personalized quizzes. Recommendations?